Southern California companies that produce hazardous waste as part of their operations have a complex web of federal, state and municipal statutes to follow in order to properly handle and store these waste streams. Proper handling of hazardous waste not only promotes a safe work environment, but it will keep companies prepared in the event that the California Department of Toxic Services Control (DTSC) comes knocking on your door for a surprise DTSC inspection. Improperly handling toxic waste could release harmful chemicals into the air, ground water, or soil, posing a serious threat to your employees, the environment and any surrounding residences. Here are 5 quick tips to keep your operations up to date, and keep your employees safe. In order to properly store hazardous materials, make sure to use appropriate hazardous waste storage containers. Use sealable containers that prevent the release of harmful chemical substances. Make sure that containers are compatible with the waste being stored and are manufactured with weather and corrosion resistant materials. Ensure that all drums and storage containers have hazardous waste labels and are properly labeled with weather resistant labels. 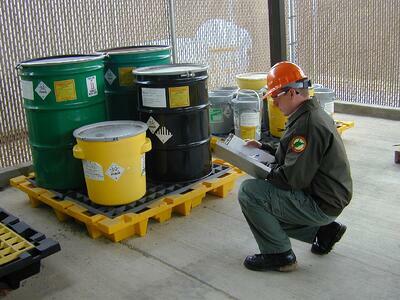 Hazardous waste should be stored in a designated storage area that is inaccessible to unauthorized individuals. The area should be clearly identified as a hazardous waste storage area and should be designed to prevent secondary containment. As part of your company procedures one of the most important practices is establish, perform and document weekly inspections of hazardous waste storage areas. A regular and thorough inspection will quickly reveal small problems that are easy to fix and prevent them from turning into large costly issues down the road. To help you with your procedures, we have created a handy weekly checklist for you to develop your procedures. You can download a free copy below. What type of hazardous waste generator are you? The Environmental Protection Agency (EPA) defines a hazardous waste generator as “any person or site whose processes and actions create hazardous waste.” Most businesses create waste in one form or another, therefore it is crucial for organizations to understand your hazardous waste generator status. The EPA defines three separate classifications, including: Large Quantity Generators (LQG’s), Small Quantity Generators (SQG’s) and Conditionally Exempt Small Quantity Generators (CESQG’s). Each classification must comply with its own set of regulations and processes with requirements being more stringent and costly the more waste produced. Complicating this process is the fact that waste generator status is measured on a monthly basis, and companies can change category from month to month based upon work flow and changes in production. A well trained workforce is crucial to maintain a safe working environment. At a minimum, companies must ensure that all employees are thoroughly familiar with proper waste handling and emergency procedures, relevant to their responsibilities during normal facility operations and emergencies. For Large Quantity Generators, the training requirements are more stringent and include classroom instruction by a certified instructor or person trained in hazardous waste management procedures. A proper contingency plan is developed by each facility owner or operator and establishes actions that must be immediately implemented during an emergency situation. Your plan should lay out an organized, planned and coordinated response to an emergency. The type of contingency plan required for a facility depends on your hazardous waste generator status. Follow these five tips and keep your facilities and employees protected. If you need help a qualified hazardous waste disposal company can help you establish proper protocols and handle your waste to keep you ahead of the regulators.